“In the space of nine months, I was involved in two accidents while riding my Harley. With the first accident, I was approaching a crossroads when a car turned right, taking me with him. The driver admitted liability in front of witnesses so, when my insurance company appointed a firm of solicitors to handle the claims for my bike, which was almost written off, and my dislocated right thumb, I thought everything would be straight forward. My bike was repaired but my personal injury claim dragged on. Everything was dealt with by claims handlers, who were obviously only completing questionnaires, while the consultant I saw about my damaged thumb was arrogant and insisted on referring to motorcycling as my ‘hobby’. In January, 2011, I was hit by a car when stopped at a pedestrian crossing. I injured my right knee and, again, my bike was nearly written off. I contacted my insurance company and the questionnaires started all over again. My Harley was repaired but I wasn’t hopeful of receiving personal injury compensation for this accident, either. 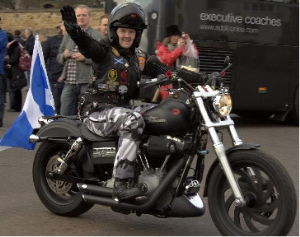 A few months later, I was in Edinburgh Harley Davidson when a fellow member of The Riders Branch – The Royal British Legion Scotland mentioned my compensation problems to the rep, who suggested I contact Brenda Mitchell at Motorcycle Law Scotland. 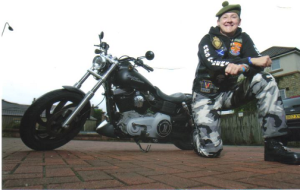 Motorcycle Law Scotland provides a very personal service and Brenda kept me fully informed. She also arranged an appointment with a consultant who didn’t talk down to me. In her report, the consultant mentioned that, as well as the need for my motorcycle to be adapted, my injured thumb might affect my future employability. With Brenda on my side, I felt I had a good chance of winning my cases – and, in December 2011, I was awarded substantially more for both personal injury claims than I’d ever imagined possible!